Okay, okay. I know y'all have been patiently waiting for more about the honeymoon. I was trying to wait until I got all the pictures back from the wedding, so I could post those first, but I can't wait anymore. I'm so ready to share this amazing time we had with you. The three days that we spent were so filled with amazing things, that I'm going to share our trip with y'all in two parts. 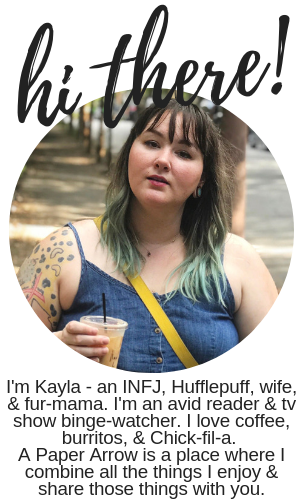 This is part one, and will include the everything except our adventures in the Wizarding World of Harry Potter, because that, of course, deserves it's own post! We spent the first day of our trip traveling. We drove to Orlando, and with stops and eating, etc., it took us close to 10 hours to arrive. Everything was super exciting, because not only was this our first major trip as a married couple, it was also our first major vacation just the two of us. The second day (our first full day), we woke up extra early and did something very grown up-we went to a timeshare presentation, which took close to three hours. It was dreadful, but we made it through a little richer. I was overjoyed when we got to Universal, as you can see in the photos below. Universal is like it's own little city. When you first arrive, you're in the CityWalk area. There are restaurants and a movie theatre, kiosks, and shops. You can spend time in this area without a ticket. It's not an area with rides or "attractions," but it's still a pretty cool place to be. The giant Universal Globe is in this area. We went to Universal Studios first (the other park is Islands of Adventure). When we entered Universal, we were in Beverly Hills. It was breath-taking, really. The park is set up like a town, with streets and shops, and it's so amazing, you truly have to see it to believe it. The first thing I did once inside was meet Scooby Doo and Velma. It was the coolest thing. 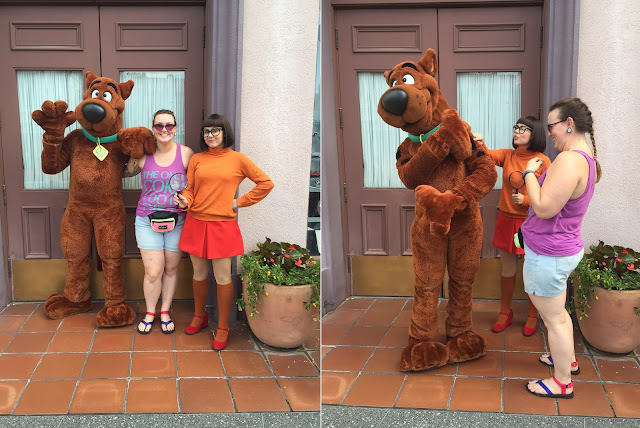 I've loved Scooby Doo since I was a child, and now my two-year old nephew loves him, so I had to get a picture. Scooby compared the spots on his arms to my tattoos, and I really just felt like a little kid. It was so exciting. Later, we did the Twister attraction. I freaking love the movie, and I was so terrified for this "ride." I wasn't sure what to expect, and honestly, it was probably the worst attraction that we did. Basically we stood in a replica of the set, and a simulated tornado happened around us. Don't worry-it wasn't scary. I was holding on for dear life. I just knew that this simulator would blow me away, but it wasn't anything like that! The Transformers ride was the first exciting ride that we did. This ride was when we really realized how Universal had really stepped up the theme park game. We were sat into a simulator/coaster like was expected. Once the ride began, it was out of this world. It was coaster, but there was also a staged set with different props, and also huge screens that made the ride almost interactive. Inside coaster-hybrids are really where it's at. Spoiler: we saved the planet. Next stop: Springfield, USA! Krustyland was set up carnival style, of course, and the ride there was a full simulator this time, but so realistic. The ride starts with you riding a crappy Krustyland coaster, which breaks and you go flying all over the place. That ride was probably the most nauseating ride, but I couldn't close my eyes because it was just too cool! We ate some really great tacos (great by taco standards, not by theme park standards! ), and Andre made sure to drink a Duff, which are actually energy drinks in the park. Surprisingly, we never ate a giant donut. Doh! The train and the Delorean from Back to the Future were right beside Springfield, but unfortunately, there was no really cool Back to the Future ride! Next, we visited the Men In Black ride, which presented itself as a presentation called "The Universe & Me," but once we were inside, we were treated as recruits and went on a wild ride killing aliens. 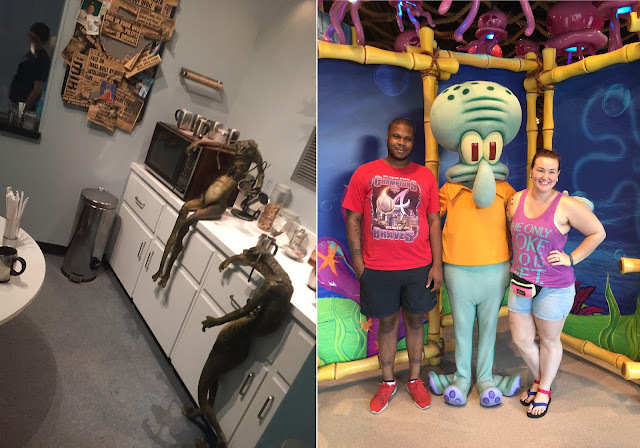 We then made quick stop at the Krusty Krab and said hello to Squidward (grumpy as ever), and rode on this really awesome ET ride that was 100% made for children. We flew a bicycle-coaster through the woods and took ET back to space. We didn't risk our lives by going to Halloween Horror Nights, because we were big 'fraidy cats, but the park was decorated throughout the day, which was pretty cool to see, without getting our pants scared off! We spent a portion of our last day at Islands of Adventure, which was pretty neat, but mostly water rides. It felt like half the park was Jurassic Park, which was really awesome, but I was kind of disappointed by the lack of dinosaur rides and scares. They did have a giant "Welcome Center" like the one in the movie, where you could play with fossils and dinosaur bones. We weren't really feeling the water rides, and walking around wet, so we didn't do too many rides at Islands of Adventure. We did take a trip through Seuss Landing, did a walk-through show called Poseidon's Fury, and rode a really awesome Spiderman hybrid-coaster. Of course, the most important part of Islands of Adventure is Hogsmeade, and the park-to-park pass, which is a must. No worries, though, I'll tell you more about that in Part Two! We went to CityWalk one night and had a really nice dinner at the largest Hard Rock Cafe in the world. While we were there, Billy Idol played. Don't freak yet. Tickets had sold out months before, so we didn't actually get to see Billy Idol, but the experience was great. I had a chocolate and caramel grown-up milkshake that was topped with bacon. Hold it, that's not all. I also had the local legendary burger which was a double cheeseburger, topped with macaroni and cheese and bacon. What?! Delish! The stained glass windows above were of Jimi Hendrix, Elvis, and Jerry Lee Lewis. The beautifully painted ceiling housed the faces of Kurt Cobain, Janis Joplin, John Lennon, Jimi Hendrix, Jim Morrison, Sid Vicious, Elvis, and Jerry Garcia. It was so beautiful! Not to mention the full-sized pink Cadillac spinning above the bar. Btw, crappy selfies are a mandatory part of any awesome honeymoon experience. I hope you enjoyed part one of our honeymoon adventures. What did you do for your honeymoon? Please share! LOL. Look at the Squidward picture! He IS smiling. :) Love you, Aunt Val. 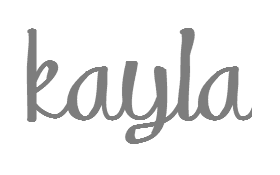 Thank you for reading/looking, April! Part two will be up on Wednesday! Universal is just so darn fun! My boyfriend and I are going on vacation to the Ozarks in a couple of months and we will be sitting through a time share meeting. Not really looking forward to it, but it saved us a lot of money on a place to stay! Also, I really like your tattoo. Just be prepared for them to ask you 37 times if you want to invest in the timeshare! Lol. But definitely worth it to cut down expenses.